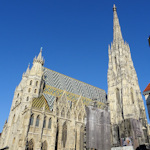 The visual image most closely associated with historical Vienna is Stephansdom (St. Stephen’s), seat of the city’s bishop and an obligatory stop for visitors. Stephansdom accompanied Vienna through much of the city’s history, with the initial foundation stone dating back to 1137. That original 12th-century church is no more. The current incarnation has its origins in 1263; the main entrance door, for example, dates back to this time. Over the centuries, various towers, extensions and other features were added to create today’s working gothic building with its sprinkling of baroque features. Amazingly, Stephansdom survived the aerial bombings of WWII, only to suffer from mindless vandalism when looters set fire to nearby buildings in April 1945. The fire spread to the cathedral, destroying parts of the building. Despite the deprivations of the post-war period, the city and community repaired all the damage within just a few years. Stephansdom now peers down benignly on the “young” buildings that surround it, like a towering giant of a great-uncle. Albeit one with a delightfully multicoloured roof. And it manages to be tranquil, reverential, and delightful in equal measure. If you just want to get a quick taste of Stephansdom’s atmosphere and architecture, you can: the front of the nave and part of the northern side are open access. Everything else requires a ticket. So you’ll need to pay (see below) to get close to the altar, climb a tower or view the relics. The “free” public area gives you views down the length of the cathedral. You can also visit several small altars with pews for prayer and reflection, light a votive candle, or visit the cathedral shop. The latter is an incongruous mix of secular and ecclesiastical “souvenirs”, where crucifixes, rosary beads and Cathedral wine rub shoulders with Mozart drink coasters. You won’t get a close view of the main altar or giant sarcophagus of Frederick III, for example, but you get reasonably close to the 1447 altar with its decorated panels. Nevertheless, I’d recommend at least taking the self-guided tour of the rest of the interior, because Stephansdom’s true delights are revealed only in close-up. Unless you’re only interested in one or two things, consider the all-inclusive tickets, which you can get on site or in advance*, and which save buying separate tickets for each attraction. These cost €14.90 for an adult when I visited, saving almost 50% compared to individual tickets. (NB: the treasury is closed temporarily). You can also upgrade your all-inclusive ticket to include a visit to the Cathedral Museum (Dom Museum) just across the square from Stephansdom. The cathedral itself is open year round, from 6 am to 10 pm (from 7 am on Sundays and holidays), and there are numerous services held every day (including a mass in English). The ticketed areas have different opening times; check my articles or the official website for details. As a working cathedral, respectful behaviour is expected. For example, remove hats, don’t eat or drink, don’t make phone calls, etc. Once you get off the bus or leave the subway station, you can’t miss the cathedral. It’s rather obvious – just look up.